So, what is Sudado? It literally translates as “sweaty”. Yummy huh? But in a food context, Sudado is a traditional Colombian stew with many variations such as Pork, Beef, Chicken, Fish and Meatballs Sudado. There are also variations in the vegetables used. Potatoes, yuca, carrots and plantains are some of the more common ones. 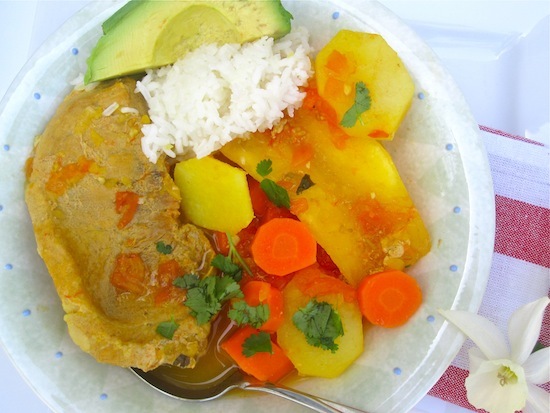 It is a popular dish all over the country and one of my favorite Colombian meals. Do you have those dishes that you want to make because you need comfort food and because they remind you of what your mom used to make when you were a child? Sudado is that kind of food for me. When I make it, I remember every detail of those family meals. I love this dish with white rice, avocado and tomato salad on the side. In a large pot, heat the vegetable oil over medium heat. Add the onion and sauté until onions are translucent, about 3 minutes. Then add the tomatoes, scallions, garlic, salt and ground pepper and sauté for 5 more minutes. Add the pork, water, sazon goya and cumin powder. 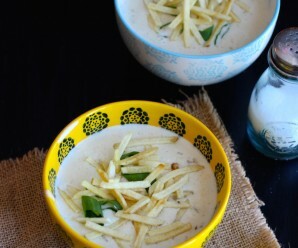 Reduce the heat to medium low cover and cook for 25 to 30 minutes, stirring occasionally. 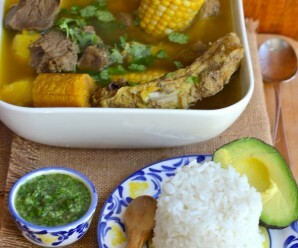 Add the potatoes, yuca, carrots and cilantro and cook for an additional 30 minutes or until the vegetables are tender. Yum. Would love that right about now! A different way to cook pork! yummy. It’s quite different than what I am used to as these ingredients were not available when I was at home but the pork stew sounds delicious. 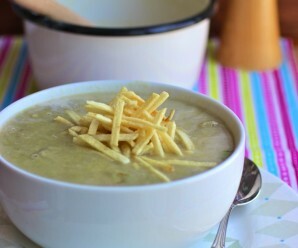 This sounds delicious…I love the veggies that are in it – yucca and plantain heaven. Comfort foods are the best. Any type of lasagna or baked pasta reminds me of my mom since that was my favorite thing that she would make! What a funny translation. Beautiful recipe though. I am a great fan of yucca. This is one for me to try for certain. Thanks. 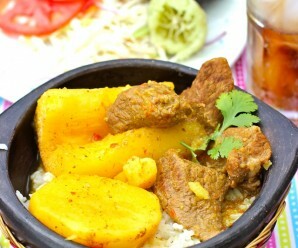 I would love to try this stew; I have never used yuca in cooking and I am intrigued by it; bet it adds a richness of flavor. Hi everyone, Thanks for the comments! Oh look at those colors – its like a plate of sunshine. I cannot wait to try this stew. I walked by a Columbian restaurant today which I made my hubby promise me we are going to soon. I have been so inspired after all your wonderful posts. I’ve never tried yucca…would love to though. This is another great stew! I like that there strands of saffron with starchy potatoes and yucca, amid big slices of pork. I e-mailed this recipe to my husband so he can have it ready for dinner last night when I got home and the house smelled delicious! The only thing he changed was substitute the onion and scallion for onion powder since I won’t touch them with a 10 foot pole. It snowed last night here in Denver and it was such a treat to have this for dinner. Erica, ¡muchísimas gracias nuevamente! I made this again with pork ribs instead and it was fantastic! i too am a second generation colombian american. i was born in Denver, Colorado but my parents are both born and raised in Colombia. thanks alot for the recipe. i am making this right now as i am typing this. i tasted the stew and tastes amazing.. bye and take care.